When you walk in you notice a nice wheelchair access ramp on the side, which is much appreciated, although a wheelchair accessible washroom would have been perfect – at least there is the ramp. Once you walk in you notice a nice bar on your right and lots of music paraphernalia: pictures and newspaper clippings with lots of focus on jazz. The inside has a very warm feel to it with dark red earthy colours. There is a main dining room on the side with seating for more than 35 people. The dining area is quite well lit with some large windows overlooking a terrace. My initial worry was the the southern BBQ cuisine would make for a meat fest which normally is not an issue with me and my stomach but since we went with my vegetarian friend this could have caused an issue. To my surprise there were many vegetarian options. We got started with complimentary cups of coffee, which was quite decent, then we plunged into the menu which offered a variety of classic breakfast options with a twist. The menu had an eggs section with a choice of one or two eggs ($4.95 and $5.95) in which the dish comes with meat but if you don’t want any you can subtract a dollar from the price. The omelette section has a “make your own” option with choice of ham, spinach, sweet peppers, onion, mushroom, cheddar, Swiss cheese, tomatoes, jalapenos with prices range from $7.95 for one filling, $8.95 for two, $9.95 for three and $10.95 for four fillings. If you don’t feel the need to build your own you can chose from one of the 7 choices starting at $6.95 and going up to $11.95. My personal favourite, the eggs Benedict section, had ten options ranging from $7.95 and going up to $13.95. 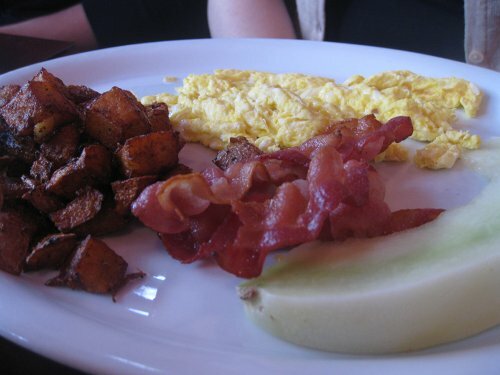 They also have a breakfast sandwich section with four options ($8.95 – $11.95). There is a house special section with various options such as BBQ brisket hash ($9.95), BBQ omelette ($9.95), breakfast tacos ($10.95), steak and eggs ($15.95), as well as captain crunch French toast ($9.95). Rounding out the menu were some old classics such as a combined pancake, French toast, crepe and waffle section. Each had the same 4 options ranging form $6.95 and up to $9.95 with an option to flambée them for $3 extra. All the way at the end there is even a yogourt and fresh fruit section for those healthy peoples with 6 options ($5.95-$10.95). We were a big group so we had the chance to order a couple dishes to get a decent sampling of the menu. 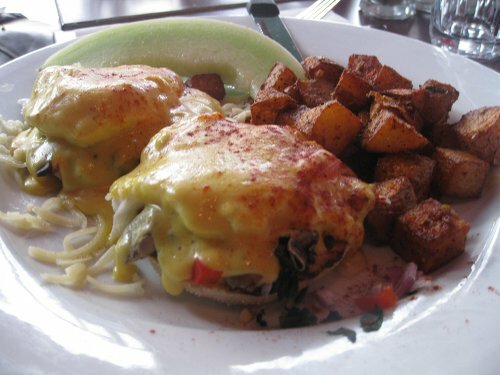 My friend started with the vegetarian eggs Benedict ($9.95) which had sweet peppers, mushrooms, onions, spinach and tomatoes. It was really tasty and jammed with vegetables and it also came with a side of potatoes and a canetloupe. The hollandaise sauce was quite good and it was just the right amount without being either too skimpy or too much. 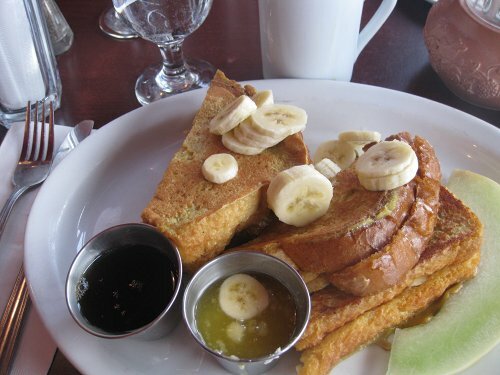 My other friend had the Stuffed Peanut Banana Raisin French Toast ($9.95) which is a marriage of peanut butter and bananas. It is quite interesting to look at as you wonder who would order this but when you bite into it, it’s quite good and definitely quite “peanutbuttery”. Normally I am not a peanut butter fan but I did like this dish and I felt that the peanut butter was even a little crunchy but it worked. My friend loved it even more and was stuffed by the end (and she only ate half because she shared the other half with her friend). Next came the strawberry French toast ($9.95) which was three slices of French toast topped with strawberries. The dish was decent although I felt that the bread could have been soaked a little longer and would have benefited by some more eggy-ness. Maybe by using a different bread than normal white bread they could have made it more fun. For example, a challah bread would have been a nice improvement. Lastly came my dish which was the Mesquite BBQ Benedict ($12.95) comprised of two eggs with either pork or brisket with BBQ sauce topped with shredded cheddar. This was a very unique dish and was very filling. 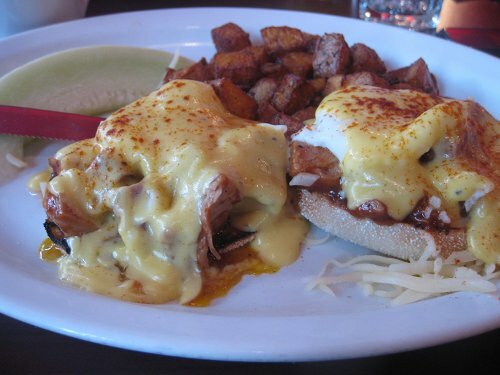 I have never had that kind of meat on an eggs Benedict and I loved the fact that they got creative and made it work with their southern cuisine style. Often I find many places will keep breakfast generic but this dish proved otherwise. Now comes a special segment from a fellow reviewer based purely on potatoes, his love for potatoes knows no ends and he has made it a point to try any kind of fries, house fries, poutines or potato like dish in this city so without further ado I present the potato review from Batàta. They offered a nice array of spices but these diced fries were slightly over-fried and seemed to be frozen before being dropped into the oil which made them a little dry at the centre. The side dish portions were good and filling. The fries had an overall good taste. I give it a 3 out of 5. The service was decent. Our waitress seemed rushed at some points and at other points I could not find her for coffee refills which did not come very frequently. We also had a friend who waited a small eternity for her side of toast. For a southern BBQ place there are vegetarian options available in almost every section which is quite welcoming and unique. There are some vegetarian dishes like the vegetarian eggs Benedict which are actually a real attempt to make a dish and not some lazy try to make something vegetarian to fill the menu. They kept the culinary theme and great taste in all the dishes, not to mention a healthier menu option at the end. I thoroughly enjoyed Mesquite. 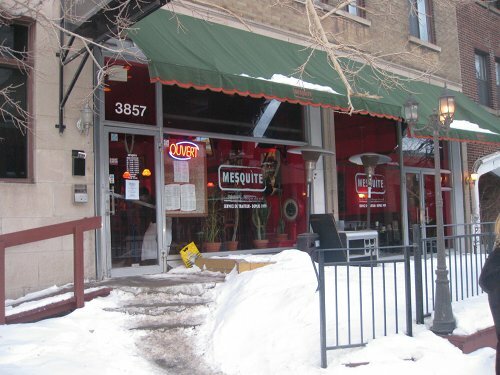 I felt the menu was very creative and brought a welcomed change to the brunch scene. The prices are very fair considering you are getting a lot of ingredients in your plate and some of them are BBQ dishes. Given a choice between normal eggs Benedict in the $12 zone and BBQ ribs eggs Benedict at the same price, I will go for the creative option. If you are a BBQ lover I strongly suggest you try it out, and even if you are not a BBQ fan I still suggest you check it out just to try something unique in the city.